VertaseFLI was engaged by Harrow Estates on a Design and Build basis to undertake remediation and earthworks on a proposed development for 190 residential units in Exeter. The site had previously operated as an opencast quarry where operations had excavated site soils to a depth of up to 20m. The site had then been backfilled up to 30m above the former quarry base with approximately 300,000m³ of unconsolidated fill which included numerous voids. VertaseFLI was engaged to undertake ground improvement and re-profiling works to provide a development platform for shallow spread foundations. 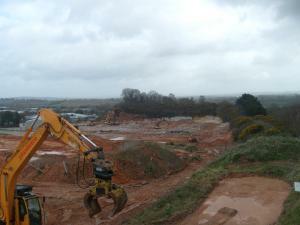 This required detailed site investigation and extensive ground improvement in preparation for earthworks. VertaseFLI produced an Earthworks Strategy which involved extensive Cone Penetration Testing (CPT) to determine the requirements for conventional cut / fill compaction and identify voids. This also determined areas requiring improvement through High Energy Impact Compaction (HEIC or rolling dynamic compaction) or traditional re-working to an engineered specification. All former quarry buildings and structures were demolished and removed. All foundations, voids and sub-ground structures were fully excavated and the resulting voids backfilled to provide a suitable base on which to commence the earthworks. This included the removal and reinstatement of deep concrete foundations, weighbridge pits, septic tanks, underground concrete tanks and structures; and areas of unsuitable clay, soft sands and buried builder’s rubble containing uncompacted quarry waste and significant voids. 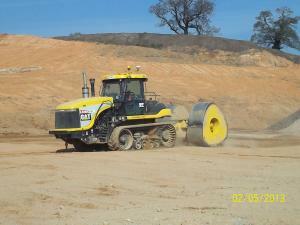 Stiffness levels of 10Kpa were achieved prior to conventional earthworks being undertaken. The earthworks were undertaken in accordance with the Specification for Highways Works, including soil classification testing and insitu compaction testing using a Nuclear Testing Gauge.